Bring Us Your Best Offer This Week! We’re celebrating the 4th of July starting on Tuesday. While we are kicking off our daily deals on Tuesday, July 3, each deal is available EVERY day next week – with the exception of the 2018 Ram Crew Cab Lone Star offer. The $269 finance offer for this deal expires on Thursday, July 5. Stop by this week for our exclusive deals and special discounts to help you find your perfect new vehicle. Check out the offers below. Take a Test Drive and Be Entered to Win a Cruise! Also, we will be cooking hotdogs and hamburgers on July 4th from 12 – 2 PM! *One offer per vehicle. Offers cannot be combined. *Cruise giveaway valued up to $1,000. No purchase necessary. Test drives must be taken on Saturday, July 7 during normal business hours to be eligible for the drawing. Drawing to be held on Monday, July 9. Participants must provide phone number and email address to Clear Lake Dodge staff to be eligible. Winner will be contacted via phone. Test drives must be taken between today and Saturday, July 7 during normal business hours to be eligible for the drawing. **FINANCE A NEW 2018 RAM CREW CAB LONESTAR FOR 269.00 PER MONTH: Offer applies to example stock number of JS173974 with MSRP of $43315.00, Dealer Discount of $4575.00 applies, Chrysler Incentives of $8750.00 (SWLJA 4500.00, 63LJ1 4000.00, SWCJA 250.00) apply. Credit qualification required and your payment may change depending on your personal credit and final bank approval via US Bank. Payment based on Tier 1 Credit through US Bank using Money Factor of .00155, which is equal to about 3.72% APR. Payment does not include taxes, title fees, doc fees, or any dealer installed options and is calculated with $3,000 as the down payment. 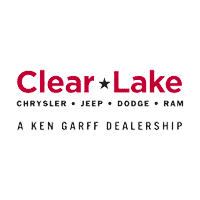 Clear Lake Dodge has trucks with different stock numbers available for the same or similar payments. Payments are based on our online pricing which does not include tax, title and doc fees, and dealer installed options. 10% cash down required upon signing and credit approval available via US Bank. Prices and payments are based on Chrysler incentives and US Bank rates and are subject to change at their discretion.